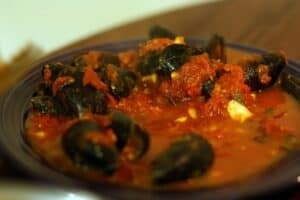 The third and main course in this dish is one that I think can be really romantic and is super easy and cheap to make: Mussels in a Tomato Broth. I also made french fries (the real way) and homemade mayo to really give the dish that Amsterdam feel. You could just serve the mussels with some crusty bread though and they would be delicious. Before I get started on the recipes, I want to note quickly that when I took the above photo I literally thought it was the best food photo I have ever taken. When I uploaded it and checked it out the next day I was very disappointed. Not that it is the worst I’ve ever taken, but I don’t think it is up to par. Homemade mussels and fries is a perfect rich main course. I like mine in a light red sauce. 1) Peel fries and chop them into 1/4-inch matchsticks. Then soak potatoes in cold water for a few minutes to an hour. 2) Heat a large pot of oil to 325 degrees F. and blanch french fries in batches for five minutes at this lower temperature. 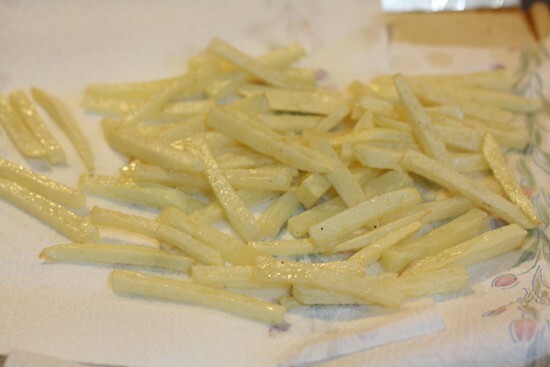 Remove the fries after five minutes and let drain on paper towels. 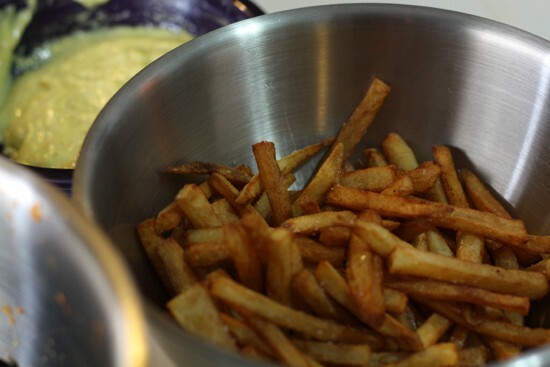 3) When almost ready to serve, heat oil to 365-375 degrees F. and refry blanched fries for 3-4 minutes. They should turn a deep brown and get crunchy immediately. 4) Drain and serve with mayo. 1) Clean the mussels by running them under cold water, scrubbing them lightly and pulling out any stuff beards that are attached to the mussels (the tiny fibers that stick out the end should just pull out). 2) In a large pan over medium heat, add olive oil and garlic and cook for a minute until garlic is fragrant. Be careful not to burn it. 3) Add in diced tomatoes, white wine, red pepper flakes, and a pinch of salt and pepper. Let simmer for 10-15 minutes. 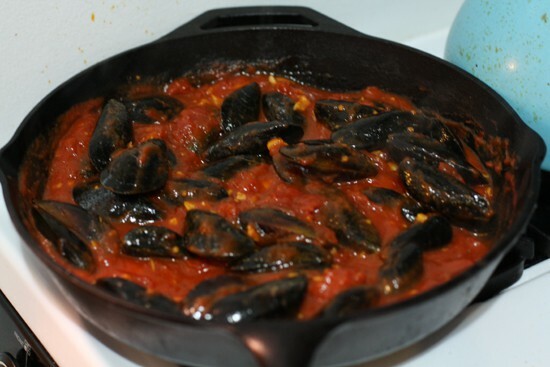 4) Add mussels, cover, and cook for about 5-6 minutes until mussels are opened. 5) Add fresh basil and stir together. Serve immediately with mayo and fries! 1) Whisk together yolks and mustard. 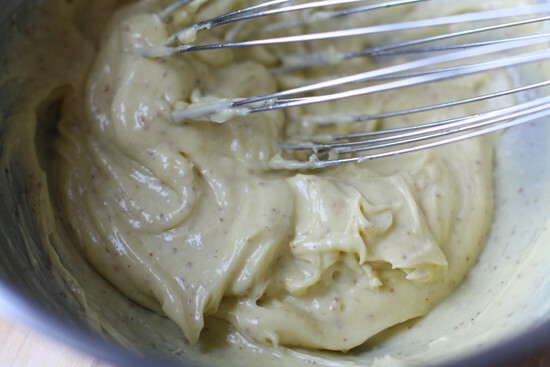 Gradually and slowly whisk in oil until the mixture emulsifies into a thick dip. Season with salt and a squeeze of lemon and set aside until needed. 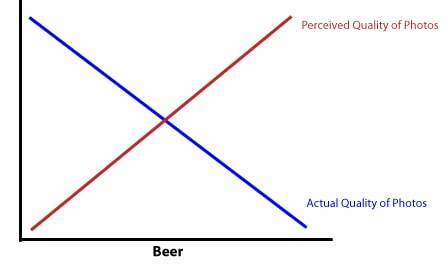 I think I can explain that using the below graph. Let’s start with the fries, or frites if you are European. Basically you want to peel the potatoes, slice them in half long-wise, and then chop them into 1/2 inch slates. Then dice them into matchsticks. Of course, if you have a mandolin this will be easy, but you don’t need one to get the job done. 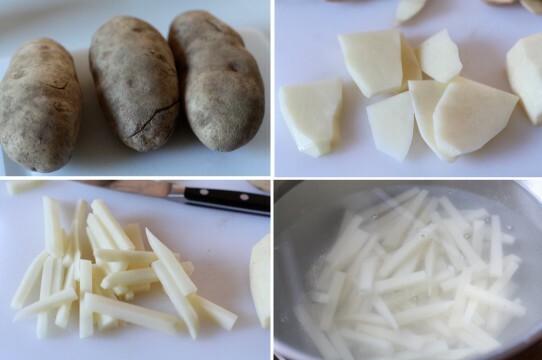 Once you have the potatoes chopped, put them in a bowl of water right away. Let them soak in the water for at least an hour to get the starch off. Keep in mind that this is how to make fries right. You can of course just throw them in the oil and they will fry, but they won’t be fantastic. Ok. If you have ever had real Amsterdam mussels and frites, you’ll know that they are usually served with mayonnaise. I’ll be honest. I don’t like mayonnaise at all usually. Or at least I thought I didn’t. I also thought fries and mayo sounded disgusting before I tried this for the first time a few years ago. But if the mayo is good then it is delicious. This is not the mayo that I spread on a sandwich as a kid. That’s right. One egg. Or more specifically, one egg yolk and 1 cup of olive oil. I was following a recipe from How to Cook Everything and it definitely set me on the right path. 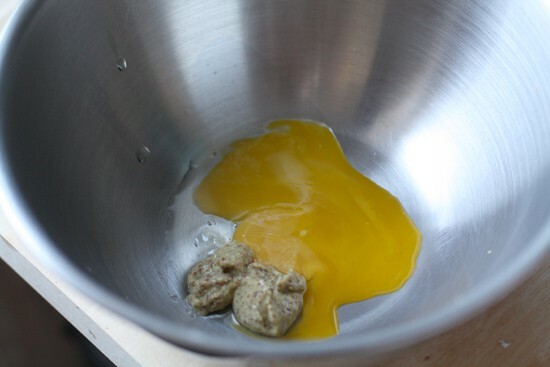 First, it said to whisk in the egg yolk with two teaspoons of Dijon mustard. If I make this again, which I will, I would decrease the mustard to one teaspoon. It was a bit too mustardy for me. In my opinion, this was too mustardy. Once this is whisked up you have to participate in an exercise of patience. 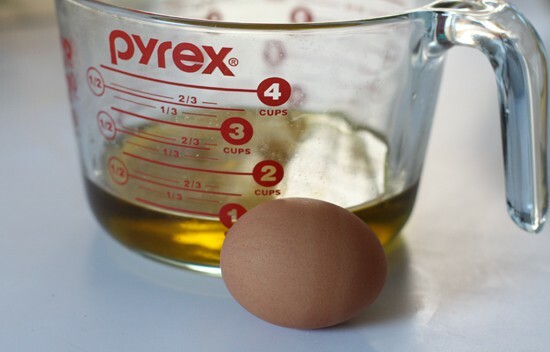 The goal here is to slowly whisk in the 1 cup of olive oil into the egg yolk. An emulsion is your desired result. There are only two ways you can fail at homemade mayo: 1) You add your oil too fast or 2) You add too much oil. Since you know that you need 1 cup, just measure that out ahead of time and eliminate that problem. I’m sorry Hellman’s. Were you trying to front? Once your mayo is made it is completely stable. It will keep for a few days without a problem. Just give it a quick stir before you serve. I think it is best right away though. Now let’s deal with the mussels. Mussels make a living by attaching themselves to rocks and the way they do this by extending this strange strand and sticking that strand onto the rock. Most of the time this weird stringy stuff is still attached to the mussel when it is harvested. This stringy stuff is called a beard because it, well, looks kind of like a beard. 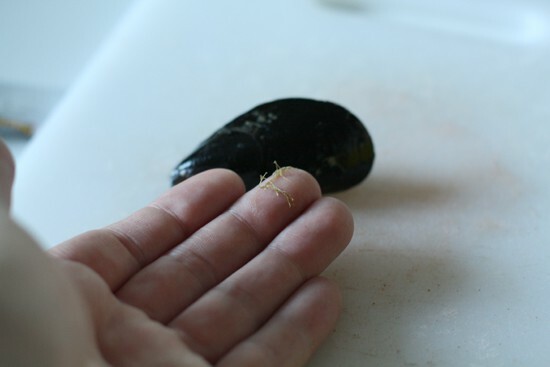 When you have your mussels run them under cold water, give them a quick scrub to remove any dirt (no soap), and if there is a beard, pull it out of the shell. If you cook the mussel with this beard in it, then you will end up with a twine like thing in each mussel. Mussels and I have something in common. Beards. Ok. Now for the quick secret about good french fries. You need to blanch them in oil at a lower temperature. Specifically, 325 for about 5 minutes. They will bubble furiously. When they stop bubbling so furiously, they are done. You don’t want to brown the fries. Your goal is to basically remove as much water as possible at a low temperature. You’ll end up with a soggy tray full of these. You can do this blanching a few hours ahead without a problem. They get better. Trust me on this. Once you are about 20 minutes out from needing your mussels you will want these: 8 cloves of garlic and a few pinches of basil. 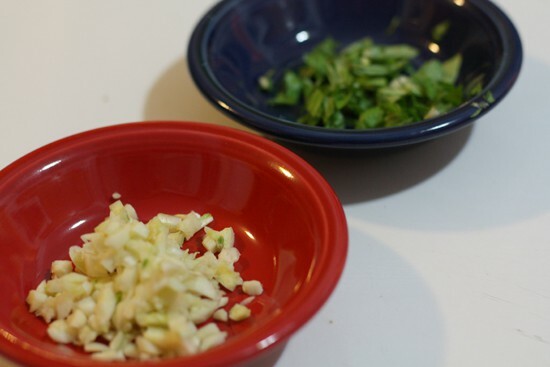 Add the garlic to a pan with 3 Tablespoons olive oil. After it cooks for about 30 seconds add a large can of minced tomatoes and a cup of white wine and a pinch of salt, pepper, and red pepper flakes. Let this simmer down for about 10-15 minutes. Then throw in your mussels. You need to cover these mussels to get them to cook efficiently. For a pan like mine, which I don’t have a fitting lid for, I covered it with foil for about 5 minutes. You know you are in business when all of your mussels are opened. Then add that basil and give it a good stir. While those mussels are cooking, you need to finish those soggy fries you have. I don’t understand the chemistry behind what is about to happen, but it works. Turn up your oil until it reaches 360-375 and then throw in your fries for about 3-4 minutes. They will start to turn golden brown and crunchy immediately. 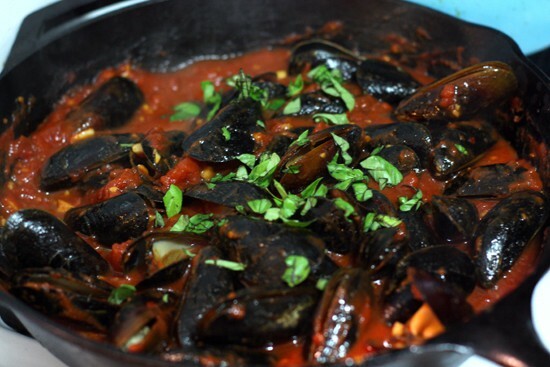 Once your mussels are open you can pour everything into a large bowl or plate them up. Mussels are one of my favorite meals and we really enjoyed this meal. The french fries, in my opinion, are worth the extra work. If you ever want to make perfect fries, that is how you do it. It is some work, but it is fail proof. The one criticism I would have of my menu at this point is that the tomato based sauce was a bit heavy with the other two courses. If I could do it again, I would do a lighter broth. That’s it for the third course. Be sure to check back tomorrow for dessert! Nice recipe!!! Your graph just *made* my day!!!!!!!!!!!!!!! Hi Nick. Thanks for the tip on the fries. Have you ever fried them in duck fat? I bought some on impulse and are going to fry them up with thefoodinmybeard. Wondering if the same method would apply. Any thoughts? Good on you for making your own mayo. I’ll have to try that sometime. Moules frites are fantastic! (My mother is French, so I default to the french spelling here). I think people are unnecessarily intimidated by mussels when they are actually very easy to prepare. I normally do mine in a lighter wine & shallot sauce though. And good call with the homemade mayo! I must have those fries and the mayo. Starring this and making it as soon as possible. Thanks for the comments everybody. Yes. I should have gone all the way and called them Moules et frites. Honestly moules doesn’t sound like something I want to eat. @Amy. I think it would work the same although I’ve never tried it with duck fat. You could always do an Bermuda Test Kitchen thing and try a few blanched and a few not… I’m sure my food blog rival would be up for it. Thanks for sharing, love the site. Hey, Nick – Me again. I wanted to print this, but I'm getting an error message. Is it just me? Thanks for the recipe! I made this today and it was super delicious.